Figure 1. 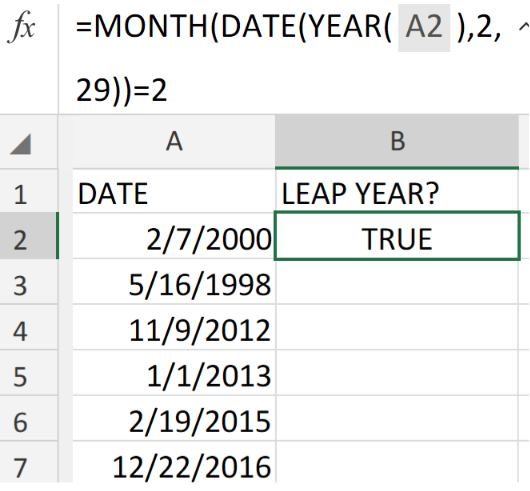 Year is a Leap Year in Excel. In the formula above, February has 29 days during a leap year, and the number 2 is for the month of February. 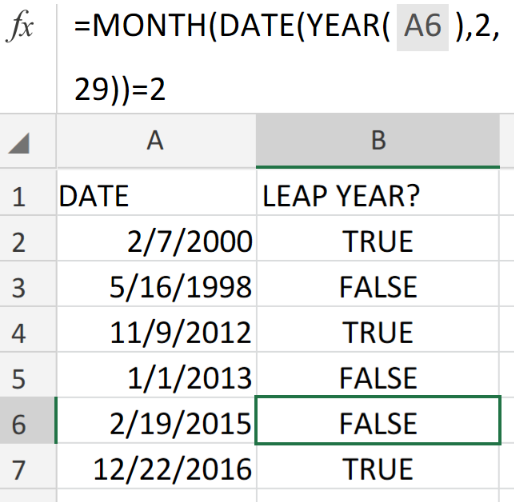 How to use the Excel MONTH, YEAR, and DATE Functions. Enter the day, month, and year values in a column of our worksheet. 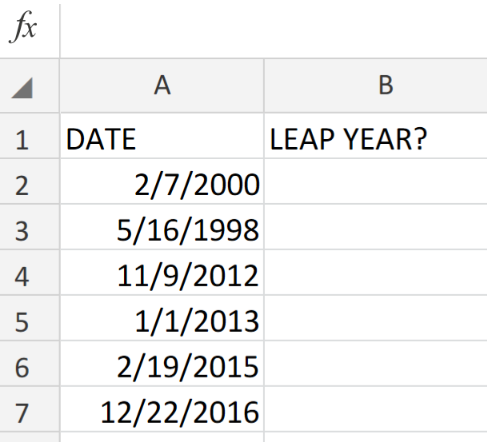 Be sure to label a separate column for Excel to indicate which of the dates occur on a leap year. Figure 2. Year is a Leap Year in Excel. Figure 3. 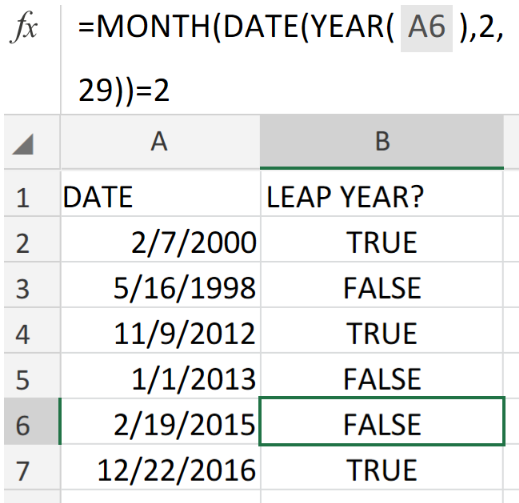 Year is a Leap Year in Excel. After Excel has returned the initial result, copy the formula into the cells down the column for the next results to be returned. Figure 4. Year is a Leap Year in Excel. If the year is a Leap Year, the formula returns TRUE and if not, the formula returns FALSE. However, during non-leap years, the date March 1 of the year will be returned by the DATE Function because the 29th day does not exist. How can I check if date from column A is from year 2016 and below, then put "FINISH" to column D if year <2017, "PENDING" if year = 2017. Our fiscal year always starts July 1st and ends June 30th of the following year, our sales week starts Tuesday, and ends the following Monday. I'm looking for a formula that will calculate each date of the full year (taking into account a leap year) and not go beyond June 30th of the following year. Additionally, I already have this formula to figure our the first Monday: =IF(WEEKDAY($A2)=2, $A2, IF(WEEKDAY($A2)=1, $A2+2, $A2+9-WEEKDAY($A2))) but I'd like to figure out how to incorporate having it not go beyond June 30th. Here is one Excel problem that I have been stuck on: Ensure each year level is a 2 digit number(i.e. starts with a zero) A130 Year 7.A Maths - Washington A131 Year 7.B Maths - Jefferson A132 Year 8.A Maths - Adams A133 Year 8.B Maths - Washington A134 Year 9.A Maths - Adams A135 Year 9.B Maths - Washington A136 Year 10.A Maths - Washington A137 Year 10.B Maths - Adams A138 Year 10.C Maths - Washington A139 Year 11 Maths - Washington A140 Year 12.A Maths - Jefferson A141 Year 12.B Maths - Adams A142 Year 13 Maths - Adams Expected Output: Year07.A Maths- Washington My solution(which does not work) was trying to use =IF(VALUE(A130), TEXT(A130, "#00')) VALUE(A130) finds the number from the cell and TEXT(A130, "#00") converts a whole number into a decimal number(two digits). And I combined those two formulas together, but it gave me an error message "#VALUE!" 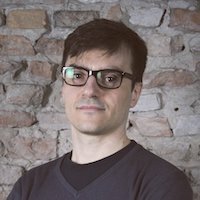 Is there any better way of solving this kind of problem? Hope to hear back from you!